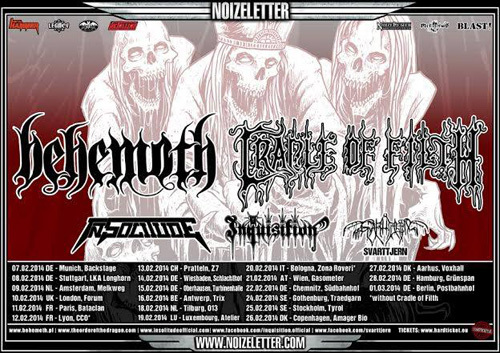 Looks like February will be bedazzled by a rather black sun when kings of Occult Rock IN SOLITUDE will embark on a 19-date European supporting English Black Metal legends CRADLE OF FILTH on their co-headlining tour with Polish death / black metal masters BEHEMOTH! IN SOLITUDE from Uppsala, Sweden is currently thrilling press and fans alike with its third effort Sister which taps into classic heavy metal vibes while remaining wholly original. The sonic experience is captivating and visceral and it belongs entirely to IN SOLITUDE! The album will surely top the media’s “Best Albums of the Year” lists worldwide. Currently IN SOLITUDE are touring North America supporting their brothers in mind, WATAIN! BEHEMOTH might have been a classic black metal act in their early days, but the priorities of mastermind Nergal shifted quickly: the following years saw the band opt for a death metal approach, and progressive / experimental influences turned BEHEMOTH into a multi-faceted and unique beast. Nergal had to face leukemia – and battled this severe disease successfully! They’ll release The Satanist in 2014 and you can look forward to pitch-black shows pairing avant-garde spirit with the atmosphere of a black mass! Transferring gothic horror from screen to record – a specialty of Grammy-nominated British veterans CRADLE OF FILTH! Cult albums like The principle of evil made flesh proved in the 90s that authentic black metal doesn’t necessarily have to come from Norway. Nowadays the band incorporates dark and death metal elements too, and recently Dani Filth made his “Fairytales for adults” come true on The manticore and other horrors in 2012. This headlining tour will mark the 20th anniversary of The principle of evil made flesh, so prepare for some true Supreme Vampyric Evil courtesy of one of the biggest names in extreme metal. Support on this tour is coming from INQUISITION and SVARTTJERN.